School Teachers Brass Hand Bell Wood Handle Antique is a vintage antique style brass teachers hand bell. Teacher's desk bell has a loud, clear ringing sound for getting someone's attention. Use this antique style schoolhouse brass bell to quiet rowdy kids, be the town crier of your neighborhood, or as a dinner bell in your own home. Teachers hand bell stands 11 inches tall with a large 6 inch bell mouth, and looks and feels like a real old school house desk bell. 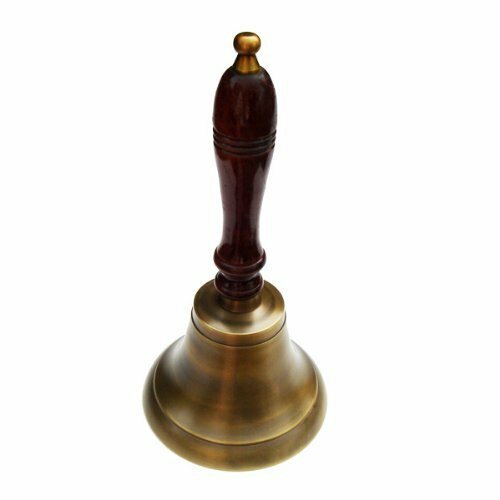 Desk bell features solid hardwood handle, antiqued brass finish bell, and brass accent on the end of the handle. This bell would make a great gift for teachers, instructors, friends, and family. If you have any questions about this product by TreasureGurus, LLC, contact us by completing and submitting the form below. If you are looking for a specif part number, please include it with your message.